Do you need to keep track of your diet? 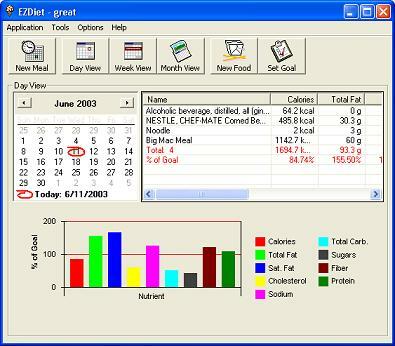 EZDiet is a powerful and complete diet management software designed to help you log your everyday diet, and manage it based on your personalized goal. It can be used for people who simply want to lose weight, and it can also be used for people who need to eat based on a special diet plan because of their medical conditions. Has over 6000 USDA defined food items pre-loaded in the program. Each food item has 9 USDA standard nutrition values. Allows you create your own food items. Combines existing food items to a new food entry. Displays Bar chart or 3D chart. Allows different serving sizes, from 1/2 to 99 servings. Comes with a tutorial to guide you through every step. Besides the pre-defined 9 nutrition values, you can add 20 more fields.